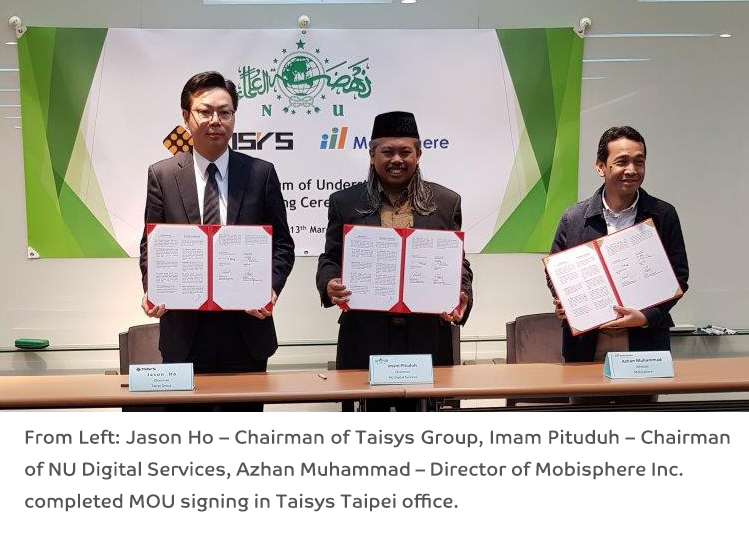 Taipei/ Kuala Lumpur, March 14, 2019 — A Memorandum of Understanding (MOU) has been signed between Taisys’ Mobisphere Inc. and PT Nusantara Digital Inovasi (NDI), the digital transformation arm for Nahdlatul Ulama (NU), with the aim of establishing a Joint Venture Company. The mission of the joint venture is to develop, implement and operate mobile eID platform to onboard and register all of NU members and offer services that are beneficial both nationwide and globally over a secured mobile ecosystem. The signing ceremony took place on March 13th, at Taisys Technologies’ headquarter in Taipei City. With over 110 million members, Indonesia’s NU is set to bring about digital transformation for the largest autonomous Islamic organization based on a secured mobile ecosystem. Services provided via this mobile eID platform include, and not limited to, mobile identification and authentication, international telco services based on remote SIM provisioning technology, cross-border remittance, mobile banking and payment services. “It is with great honor and pleasure for our technology to be the foundation of NU’s mobile eID implementation. Taisys has long been a trusted mobile ID solution provider for banking services since the 2G/feature phone era. Now that smartphones and APPs manage our daily work and lives, the need to use the phone as a form of identity authentication and transaction authorization is increasing ever more. The beauty of our mobile ID solution, which sets it apart from others, is that it can accommodate beyond authentication services for banking and Fintech, to include digital SIM services where mobile subscriptions are downloaded onto the phone. This is the perfect example where the use case can be supported by the right technology, elevating the comprehensiveness and industry/device/telco agnostic nature of Taisys mobile ID solution,” stated Taisys Chairman, Jason Ho. “This mobile eID shall create the next level of digital ID security in addition to the services to be offered by NU to its communities such as mobile payments/ wallets, telco services, fintech and banking services. NU has worldwide members, and in upholding NU digital sovereignty objective and creating service layers within a secured environment, NU members in particular and Indonesian nationals in general will be benefitted most. NU has significant number of its members residing in Taiwan, Malaysia, Middle East and other parts of the world. For example, over 1 million NU members in Malaysia are regularly doing the remittance to their loved ones, and through this JV initiative, it will create the digital security eco-system for NU communities in Indonesia and beyond. Not to mentioned their mobile daily usage for work and lives. This augurs well with NU objective in digital transformation,” stated Imam Pituduh, Chairman of NU Digital Transformation Services. “We are proud and excited to be part of this Alliance that enhances NU community and members’ digital identity authentication. The digital services must be supported by secured mobile and APPs experience in creating unmatched “secured convenience”. This will add into the eco-system that Mobisphere already developed that involved banks, non-bank, remittance provider and social media players. Mobisphere FlexTM in Malaysia is backed by an Islamic Bank, while in Indonesia and other 20 corridor countries, it has cooperation with banks, financial institution non-bank, switching operator and social media player; therefore, through mobile ID platform with services on-top, it is truly is a working example of a complete eco-system for NU communities” stated by Ady Seto Bremono, Mobisphere Indonesia Director. NU was established on January 31, 1926 in Surabaya, Indonesia. It is the largest independent Islamic organization in the world. NU also is a charitable body funding schools and hospitals as well as organizing communities to help alleviate poverty. The NU exists to spread Islamic teaching. As well as preaching, it undertakes educational activities through its network of 6,830 Islamic boarding schools, or pesantren. It also owns 44 universities, and is involved in economic and agricultural studies, and social activities including family planning. We are an ASEAN regional provider of mobile payment platform and remittance switching service and JVCo of Taisys, operating as Taisys’ ASEAN regional technology and platform provider. We aim to provide an efficient, cost effective and reliable remittance, payment infrastructure and accessible travelling internet connectivity to multitude of communities of various countries. Easing of remittance back home or roaming freely in 200 countries are services values that Mobisphere’s denotes. Anytime, Anywhere. We Transact. Taisys Technologies is a world leader in providing mobile interconnectivity and vertical integration solutions to various industries. Our solutions enable telecom, financial institutions and government organizations to extend innovative mobile services in a secure and convenient manner. Over 1,300 banking and 20 M(V)NO partners have deployed mobile-based value-added services enabled by Taisys’ technology and platform to 15 million end-users worldwide. To learn more, please visit www.taisys.com.